The 10-man working committee constituted a few days ago by the National Economic Council to end attacks by herdsmen has decided that every state should, by a rigorous consultative process with all stakeholders, design its own solutions. According to Daily Trust, the committee, headed by Vice President Yemi Osinbajo, comprises the governors of Zamfara, Kaduna, Adamawa, Benue, Taraba, Edo, Plateau, Ebonyi and Oyo States. A highly placed Presidency official privy to the activities of the committee revealed to State House correspondents on Sunday that the committee had resolved that the Federal Government would not impose any solution on any states. The official disclosed that Osinbajo, at a recent meeting of the committee, assured that the Federal Government would certainly not impose its ideas on the states. 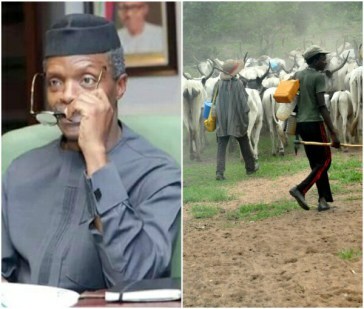 The official, who craved anonymity, said the vice president noted that fears being expressed on the cattle colonies proposed to establish by the Federal Government were misplaced. He said the committee also resolved to work with the Federal Government to strengthen law enforcement as well as all security and intelligence agencies so that they could coordinate better in dealing with the crisis and preventing it from further escalation. “The role of bandits and suspected mercenaries in what has become known as herdsmen/ farmer clashes and violence may have provoked the need for a fresh approach to dealing with the crisis,” the official stated. He also said that the military was already engaged and would soon begin to take decisive steps to address the situation. He said the police and other security agencies had also been directed to recruit more rank and file to beef up security in the troubled spots in particular and the country in general.